Recently my task was to allow client to have different "type" of order in Magento. 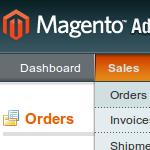 Requirement was that these orders need to have their own grid in Magento admin, and also that they need to be processed somewhat differently than regular orders. I have solved this task by adding new order states and statuses to be used only for this type of orders. To support this design it was also required to create new payment method so that orders of this type can be initiated into new order state automatically after being placed using this payment method. In this article I'm bringing you some code snippets and notes on how to implement this kind of solution. This entry was posted in Magento, Web Development and tagged e-commerce, Magento, order state, order status, payment method, PHP on November 7, 2013 by Marko.